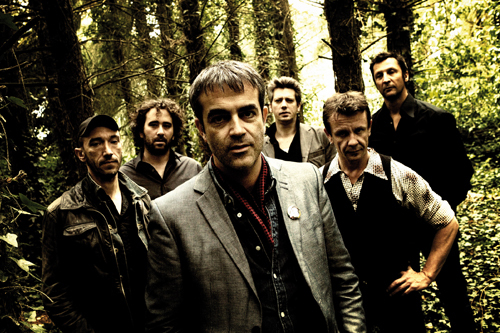 Discover the Rennes-based band Santa Cruz performing live and acoustic at the Institut français, in an ultimate showcase of the best of Breton music before the end of the Brittany-Scotland year. Created in 2002 in Rennes, Brittany by seven strongly accomplice musicians, Santa Cruz is a band scoffing at geography and references. In their first album ‘Welcome to the red barn’ they prove themselves ingenious multi-instrumentalists. With English lyrics, instrumentations and real knowledge of North American traditional music, the band naturally grounded itself in the long Americana tradition. The melodies and this capacity to describe landscapes, images, sensations and interior adventures in a few notes gave the band a singular identity. After 4 albums, Santa Cruz has gathered a large crowd of fans thanks also to their stage performances full of elegance and chic. The band is internationally known and recognized by important bands such as Archive who covered one of their songs. For this Scottish performance, Santa Cruz will go off stage to play surrounded by the audience and in an acoustic set. Book your ticket now by phone : 0131 225 5366 or in person at the French Institute. Meet the band just before the concert in the ’Oreille musicale’ special Santa Cruz. In this informal talk, they will chat about their influences and musical experiences.